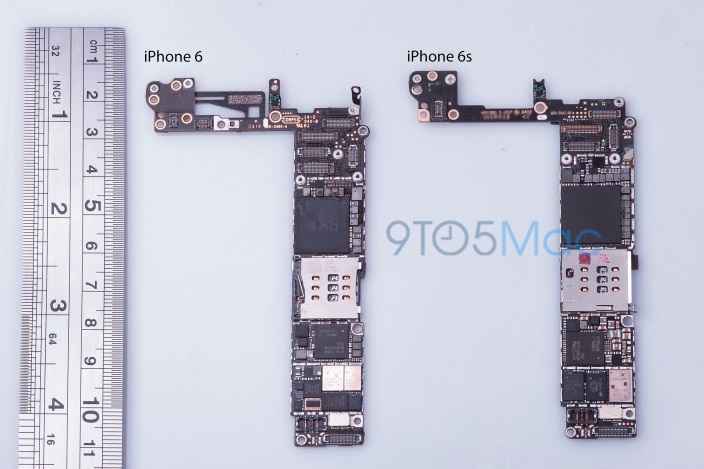 New images of the logic board from the next-generation "iPhone 6s" have been obtained by 9to5Mac, a few days after the site shared photos from an unnamed source which showed that a new, updated Qualcomm LTE chip could be in store for the iPhone this year. Today's images suggest that, on top of the Qualcomm chip's faster LTE speeds and increased energy efficiency, the iPhone 6s will include fewer chips that are collectively more efficient, updated NFC hardware for Apple Pay, and likely the same 16GB entry-level capacity seen on current iPhones. 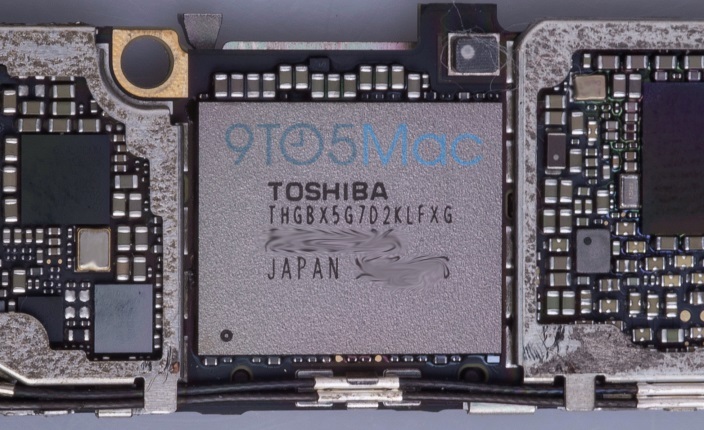 The Toshiba flash memory chip shown in the photos has a 16GB capacity based on the "G7" in the part number, and was built using a 19nm production process. This suggests that the new line of iPhones this year will once again offer a starting storage option of 16GB, likely supplemented with the same 64GB and 128GB options at higher price points seen currently. While many have complained 16GB is not enough entry-level storage as HD video and space-hungry apps have proliferated, recently Apple SVP of Marketing Phil Schiller claimed the company's cloud-focused services, like the just-launched Apple Music, help alleviate some of the storage stresses on low-end storage configurations. Other changes with iOS 9 such as smaller iOS update sizes and app thinning to load only the app assets needed for a particular device, will also help trim down storage needs. On the NFC side of the new iPhone, the new chip inside the iPhone 6s is again from NXP but with a new 66VP2 part number compared to the 65V10 part in the iPhone 6. Chip teardown experts at Chipworks were unclear, however, exactly what kind of improvements such a chip will bring to the new line of smartphones, although they posit it could be eliminating the need for a separate secure element processor altogether and folding the two into one chip. Echoing earlier rumors, today's images suggest once again that the iPhone 6s will remain identical in look and shape to its predecessor, as seen in a case maker's design drawings and logical for the continuation of the "S" generation trend. Any changes in dimensions would be negligible, leaving the device compatible with nearly all existing iPhone 6 cases and accessories. My biggest regret is buying the 16GB iPhone. Please make 32 the entry level! Why can't they just up the base model to 32 GB already? They only make the 16gb because people buy it. If you stop buying it, they'll stop making it, is that simple. They've got balls. I'll give them that.